From a practical standpoint, the most important difference between chemical reactions, such as burning coal, and nuclear reactions is size. The nucleus of an atom is about 100 thousand times smaller than the whole atom, so there is as much separation between what nuclei do and what atoms do as there is in a carnival of amoebas within a parade of dinosaurs. When we put two chemicals together, the atoms touch and decide how to rearrange themselves, but the nuclei just so along for the ride. Nuclei are hard to manipulate because even atom-sized fingers are too stubby. We might have never even learned about the existence of nuclei if they had not announced their presence with bright flashes of energy. The spontaneous decay of an individual nucleus emits millions of times as much energy as an individual chemical reaction. Tapping nuclei as a source of power was a popular idea— among science fiction authors— when Rutherford disparaged it in 1933. Many of the imagined flights to the moon written in the 20’s and 30’s were launched by nuclear rockets. Rutherford dismissed the idea because up to that time, the only way to coax nuclei to give up their energy was by needling them individually with neutrons or other particles. Spilling individual drops of water of the Hoover Dam releases a lot of energy per drop, but not much energy overall. To get energy out of chemicals, we look for situations in which one kick starts an avalanche, so that the atoms themselves do most of the work. Fire has traditionally been our favorite energy source because we only need to set a match to timber, or wick, or whale-oil, or coal, or gasoline, or biofuels to start a cascade of chemical reactions. All of these fuels are chemicals that want to bind with the oxygen in the air to become carbon dioxide and ash or smoke. They “want” this in the sense that it would lower their energy, but they can’t do it on their own because the process itself costs energy. We provide the kindling, a little energy in the form of heat, and the fuel reacts, producing more heat, causing more reactions, in a chain that either cooks our meat or burns down the village. The idea for nuclear chain reactions must have been inspired by the analogy with fire. (Leó Szilárd, the inventor, said that he was inspired to prove Rutherford wrong.) Nuclei, cocooned so deeply within their atoms, do not feel any heat whose temperature is less than that of the sun. But uranium-235 nuclei have a clever alternative: shooting a neutron at a uranium-235 nucleus can cause the nucleus to split, and in the process of splitting, it releases 2–3 more neutrons. If an average of one outgoing neutron strikes another unsplit uranium-235 nucleus, then the process will continue on its own, like wildfire. This is surprisingly difficult to do. Today, almost 70 years after the first successful nuclear chain reaction, only four types of nuclei are known to be usable for energy production, and three of them are man-made. Nature was extraordinarily kind to us, or unkind, depending on your point of view, in giving us the one: uranium. Moreover, only 0.7% of natural uranium is combustable uranium-235, so chain reactions fizzle out because most of the neutrons miss their targets. Without purification, the rock won’t burn. 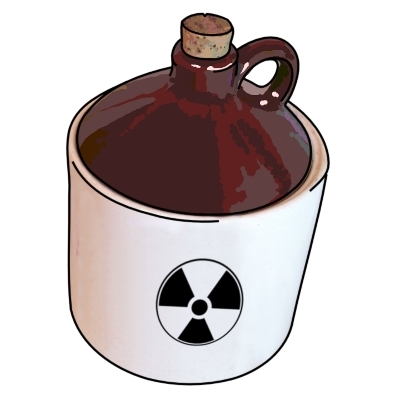 This is how nuclear energy resembles moonshine. Suppose that we’re making liquor to fuel a car— I think something like that happened in The Dukes of Hazard. Alcohol can be found naturally in decaying fruit, but the concentration usually isn’t high enough to burn in an automobile engine. The combustible alcohol molecules are distributed uniformly in water (and other gunk) that absorbs the heat and stops the chain reaction. But with a well-stocked outdoor shed, we can purify the alcohol by repeatedly separating the part with alcohol-like properties (low evaporation temperature) from the part with water-like properties. At 180–190 proof, you’re liable to blow the whole shed. Purifying uranium is much more difficult because the only difference between the combustible uranium-235 and the inert uranium-238 is that the latter is slightly heavier— there are no chemical differences (like evaporation temperature) to use to separate them. The best known way to do it is to dissolve the uranium in liquid and spin it in a centrifuge: the uranium-238 sinks slightly lower. While it’s spinning, you can cut it and put the lighter part in another centrifuge— many, many times. The difficulty of this procedure is what keeps most states from becoming nuclear states. How pure the uranium needs to be depends on what you’re going to use it for. To produce electricity, the natural 0.7% concentration needs to be increased to 3–5%. To make a bomb, it needs to be at least 20%, but usually 80% or more. Thus, it’s much easier to make energy than to kill people, but anyone with enough centrifuges in their backyard has the option. When alcohol is burned, it becomes carbon dioxide and water. Enough water could suffocate the fire before all of the fuel is used up. Nuclear reactions have the same kind of problem: the by-products of split uranium nuclei like to eat neutrons, which dampens and eventually stops the reaction before even 1% of the fuel is consumed— most of the “waste” coming out of a reactor is actually fuel. This was the subject of Flagg and Zebrowki’s 1952 article, and it is still true today: recycling could dramatically improve the efficiency and reduce the radioactivity of the waste. Nuclear recycling has had a rocky history because some of the by-products of the reaction (plutonium in particular) could be used to make bombs. Even if the waste is left in a vault for ten thousand years, it will purify itself into ideal bomb-making material on its own, because combustible plutonium decays more slowly than inert plutonium. Nuclear recycling was banned in some countries, such as the U.S., but it is practiced in a limited form in others. A main focus of future reactor designs is to find a way to recycle fuel more safely, more out of reach of nuclear terrorists. What astonishes me in all of this is how much the true difficulties with nuclear energy differ from what is often said of them. For one thing, it is impossible for a commercial power plant to explode like a nuclear bomb— its uranium-235 concentration is far too low— though it could explode like an old-fashioned steam engine, if the engineers are not careful. That is, it could explode like a steam engine filled with radioactive chemicals. And nuclear waste, far from its image as a nasty, useless toxin that no one wants, is dangerous because it is so valuable and useful to evil people.